X-Plus 30cm Titanosaurus | Fresh Vinyl HQ! 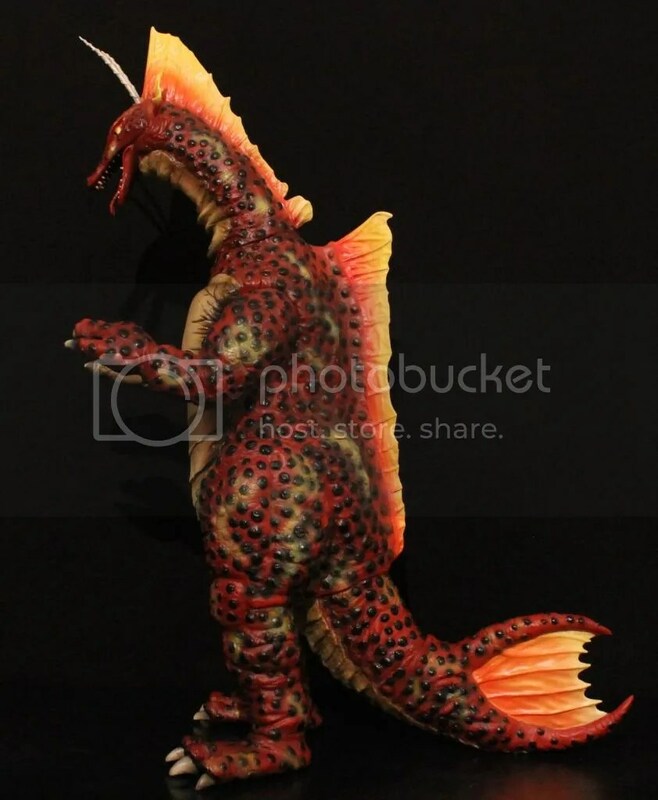 X-Plus released the Toho 30cm Series Titanosaurus in September 2012. Upon release, this figure was priced at about $160 or so, take into account the fluctuating prices of the Japanese Yen to the US dollar. 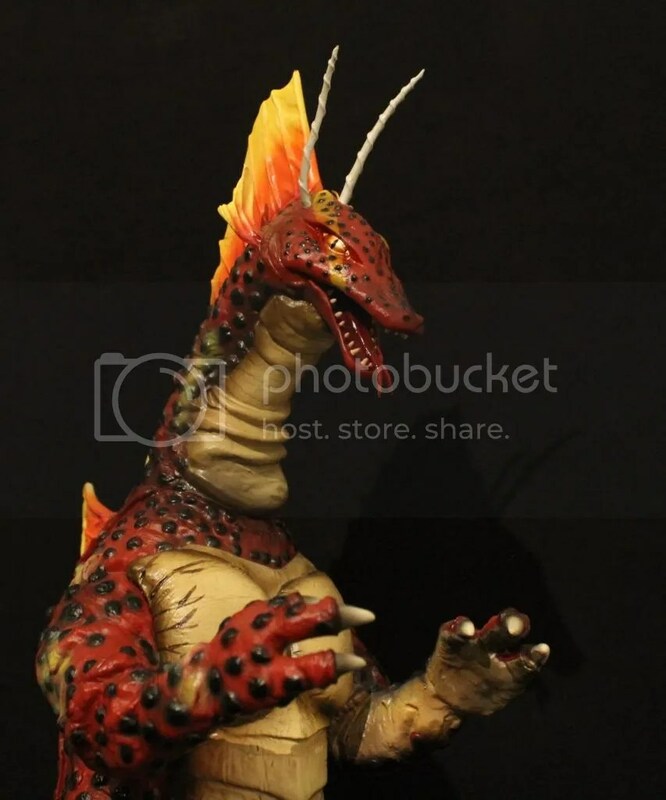 Titanosaurus was available from well known online shops as Hobby Search and Amiami during the preorder window and quickly sold out after release. 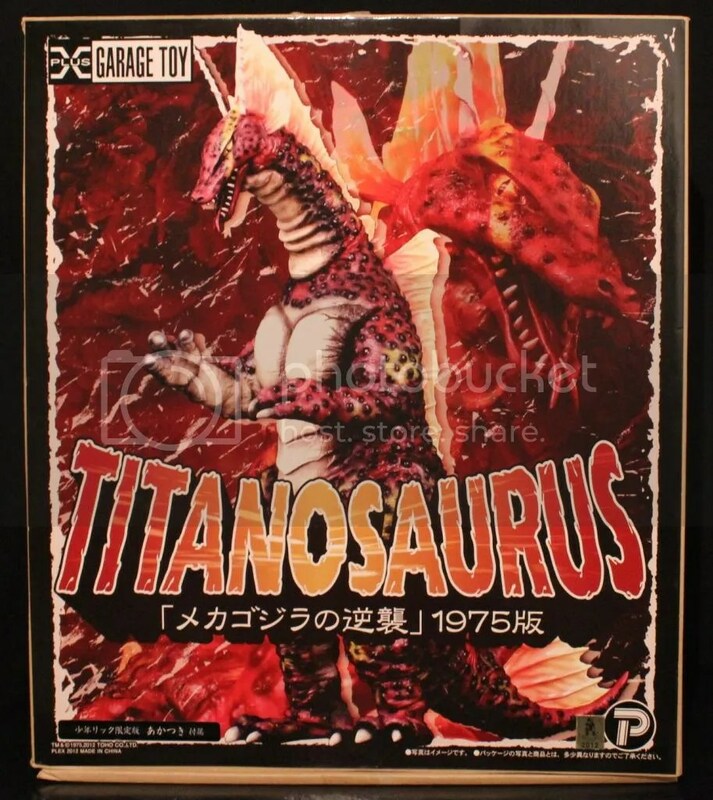 Titanosaurus is highly sought after by many X-Plus collectors, making this very hard to find and pricey as well. If you have one, hold on to it! At a first glance, the figure is stunning! Lots of detail and vibrant colors. There was some concern after the early production photos were released about the yellow highlights looking like the figure was squirted with mustard but highlights here on my figure are not distracting at all. Titanosaurus is just beautiful from head to toe, mustard or no mustard! THE BOX! I know, I know, its the same old song and dance with these boxes. This box is just as beautiful as the figure is. Lots of red vibrant colors are splashed on the box with Titanosaurus front and center. This is the actual figure on the box. A larger pop of Titanosaurus is off to the right, you can miss it. 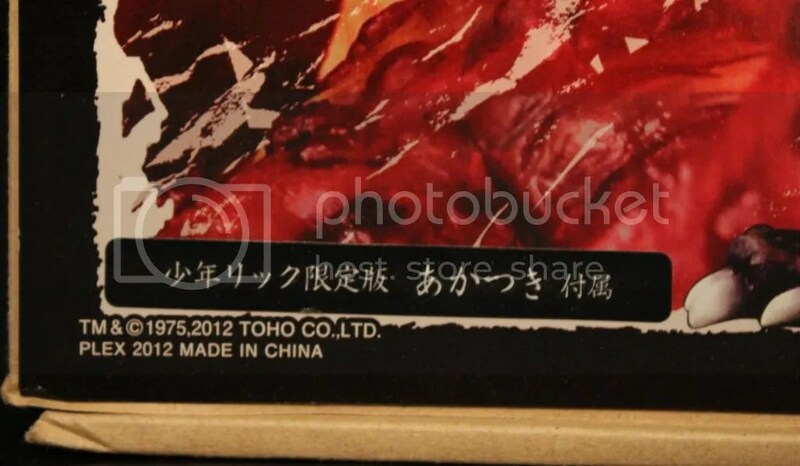 Titanosaurus’ name is centered under the image of the figure and underneath that is the title of the film, メカゴジラの逆襲, MechaGodzilla’s Counterattack, which is the original Japanese title of the film. The rest of the box is brown card board and the back has the legal info that no one cares about! If you notice at the bottom of the box there is a black label. 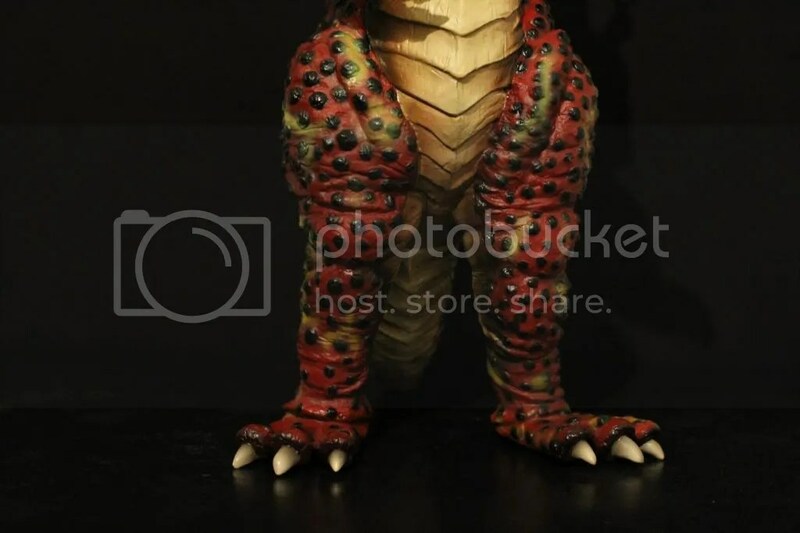 The black label signifies that this is the RIC exclusive Titanosaurus. The extra that comes packaged with Titanosaurus is the submarine that was attacked by our giant dinosaur here in the beginning of Terror of MechaGodzilla, the Akatsuki. We will cover the sub later on in this review. But that is the box! Plain and simple! Ahhh, the figure! 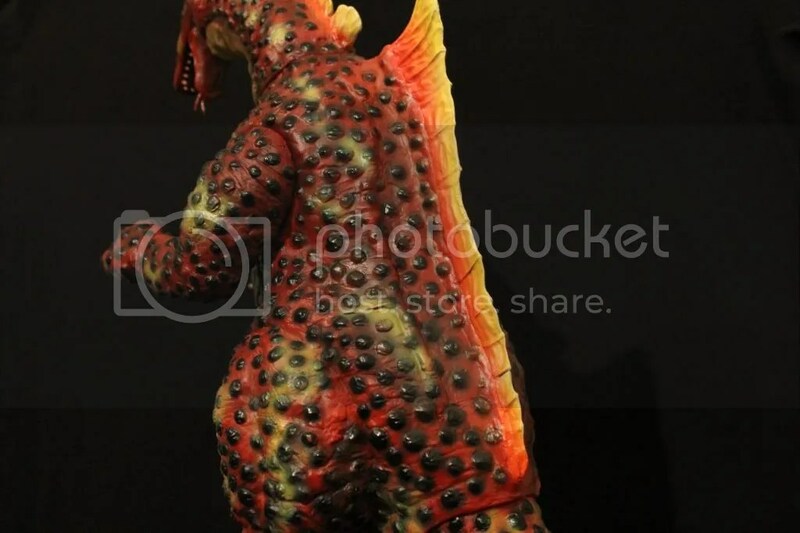 Titanosaurus stands at 14 inches tall which is equivalent to 35.5 cm’s! 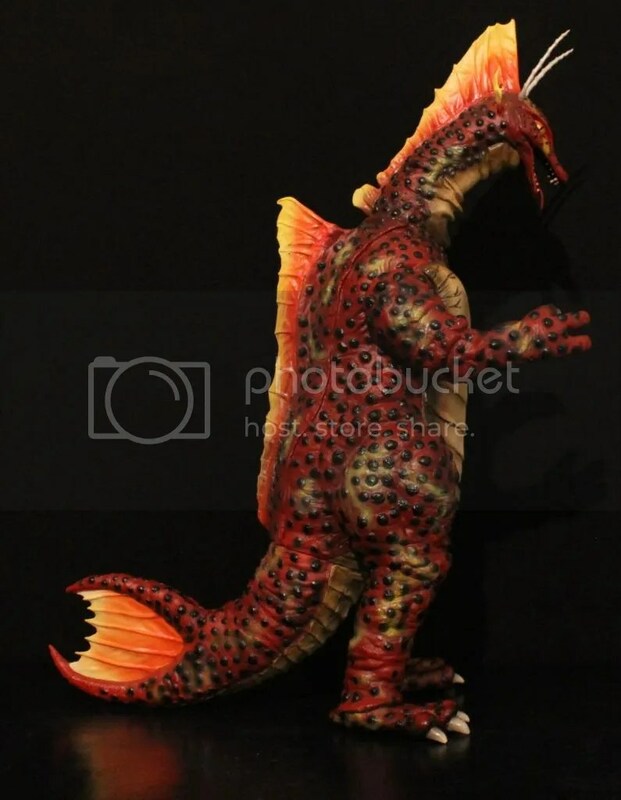 Yes, this figure is in the 30cm scale but Titanosaurus is a tall kaiju which packs on the extra height! 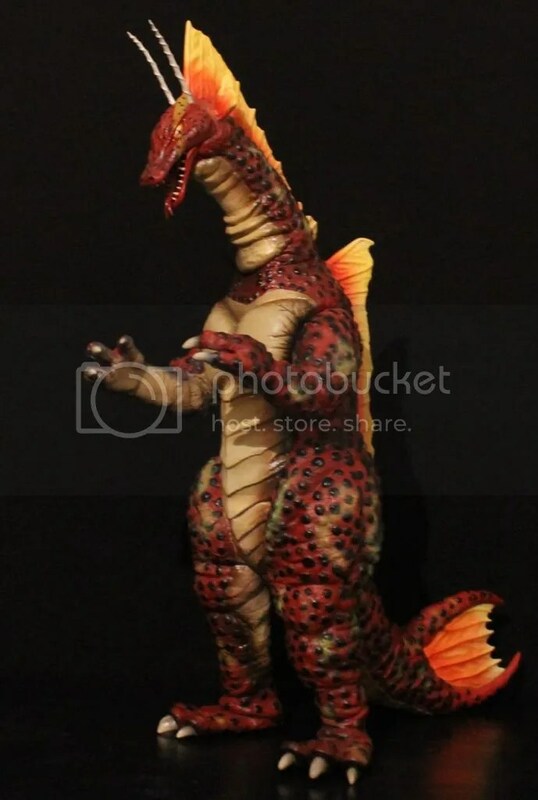 This is actually one of the tallest Kaiju in the 30cm line up along with SpaceGodzilla and Hedorah. While we are talking about the size of this figure, Titanosaurus is not really a shelf hog. The figure is pretty slim and it does not have a big footprint. With a short tail, this helps with positioning on the shelf as well so you won’t have to worry about any swooping tails reaching to the back of the shelf getting in the way with other swooping tails. 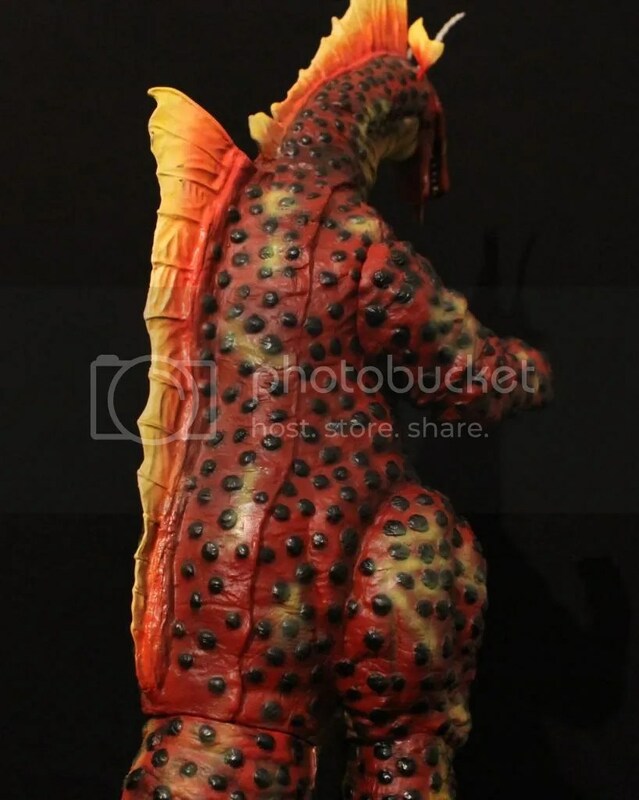 The figure is packed with detail, fresh detail and detail unlike any other Titanosaurus figure that you have seen. From the bumps that cover the body to the muscle cracks in his chest, Titanosaurus is simply stunning from every angel. The chest is really pronounced and I think the attention to detail there was done very well. Titanosaurus does have a muscular build and X-Plus did not cut any corners from replicating these muscular features out of this figure. Everything is sculpted beautifully. The antennas on the head are almost like unicorn horns. They could have been made a size thinner but when it comes to molding vinyl, the process to mold at the level of detailing that is being done becomes harder in areas where there is less vinyl to play with essentially. Nonetheless, the antennas look great as they are swiveled up to the tips very nicely. The face is just amazingly sculpted right from the ears to the tip of the snout. The narrowness of the eye brows is really awesome as they are perfectly sculpted capturing that look Titanosaurus had in his only feature film. The dorsal fin starting from the top of the head down the neck is really well done too. The detail is just splendid as it is not just a flat piece of vinyl, it is actually sculpted with groves and creases giving the fin a complete sense of realism to it. The same can be said for the dorsal fin going down the back of the figure. Just beautifully done. The neck is done really awesome. Titanosaurus has a bit of a lean in head going forward. Because of this lean, the skin on the neck is wrinkled a bit to replicate the skin folding. The arms and chest, again, sculpted superbly. The muscle tone in the arms is done nicely to match just that of the suit. Again, that is the whole idea with X-Plus figures, to replicate the suit as accurately as possible. The chest, again, cracks on the edges of the pecks, giving the sense that the muscles of this dinosaur are just bulging. Everything looks great! This figure is just a joy to look at! Look at that face! Look at all the detail there! It is really amazing how well this came out. The colors pop no matter which way you look at it. The yellow highlights as I stated earlier were thought to look like squirts from a mustard bottle. I think they look great here as they are not over done. The yellow highlights, as you can see crossing the face, are subtle. The yellow is not over done. I bet you didnt really notice the yellow until I mentioned it. They eyes are just gleaming! There is gold, black, red and orange all packed in there to give off this cat like look. All the bump, dimples if you want to call them that, all painted dark brown, almost black. Every little dimple you can feel as you run your fingers over it. Again, the antennas on the head are unicorn like. They could be thinner but they are not really that bigger than what they should be. The mouth is sculpted, again, beautiful. The teeth are sculpted very nicely on the top and bottom of the mouth. They are individually sculpted and painted bone white. The tongue is perfectly sculpted with a snake like split at the tip and features a life like paint job, looking like it is covered in saliva. Everything looks amazing. The arms and hands are no exception to superb detail here. The arms, like the rest of the body, is covered in dark brown bumps and colored with a brick red skin tone with subtle yellow highlights scattered about. The inside of the arms is painted off white with subtle hints of brown to give the figure a sense of depth. Again, I talk about depth all the time. DEPTH! DEPTH! DEPTH! You do not want a flat paint job here people! With different layers and colors applied about the figure, it gives the whole figure a sense of depth. A flat paint job does nothing for anything. Depth…get it! Makes a figure so much fresher! The hands are sculpted perfectly featuring the only three fingers on each hand. That was how the suit and Kaiju were created, only three fingers. Hey, at least Titanosaurus can go bowling, right! The chest just looks magnificent. The cracks from the pecks are painted perfectly. From a distance, you can’t tell the cracks were painted on. From a distance, the cracks look like they were actually sculpted like that. Job well done X-Plus with the paint job in this area, it is amazing how well done this looks. The shading between the pecks and abdomen is really well done too. light highlights of brown to accent and shadow the muscle tone. BAM! Looks awesome! Here is a closer look at the hands with all the dimples about. The finger nails are painted bone white with nice dark highlights as the they flesh out from the fingers. I am literally sitting here looking at these pictures and just admiring how well everything is done on this figure. The stomach follows suit with detail and paint. A slim stomach with segmented scales that expand down to the tail. Painted with nice accents with brown at the edges. This is the depth I am talking about. The lines are not flat clean lines. Everything is painted smoothly to look like this is a living beast. The legs are painted in the same fashion as the rest of the body. Red/orange skin with yellow highlights. Dark brown dimples al about. The inside of the legs are painted with the same off white color as the chest and stomach, again edged smoothly with subtle browns. The feet are sculpted just to that of the suit, looking like big clown shoes! I love how the toes are sculpted, big and round just before the toe nails. The toe nails are painted in bone white and like the finger nails, they are painted with nice shades and highlights from where the nails grow from the toes. The back of the figure features the dorsal fin. The fin is painted with red, orange and yellow all faded up nicely from once color to the next. The dimples, like everywhere else on the body, are the same on the back. Paint is all the same as well with the skin tones. If you have not noticed, the skin has wrinkles in some areas. These wrinkles are from the suit actually wrinkling. Watch the movie and you will see how the suit actually creases and wrinkles in areas of movement. Now, one feature that I really love is the seam you see on the right side of the back. What is that seam you may be wondering. That seam is where the suit opens and lets the suit actor enter and exit. This is where X-Plus just blows my expectations out of the water. I love that the smallest details are replicated here. 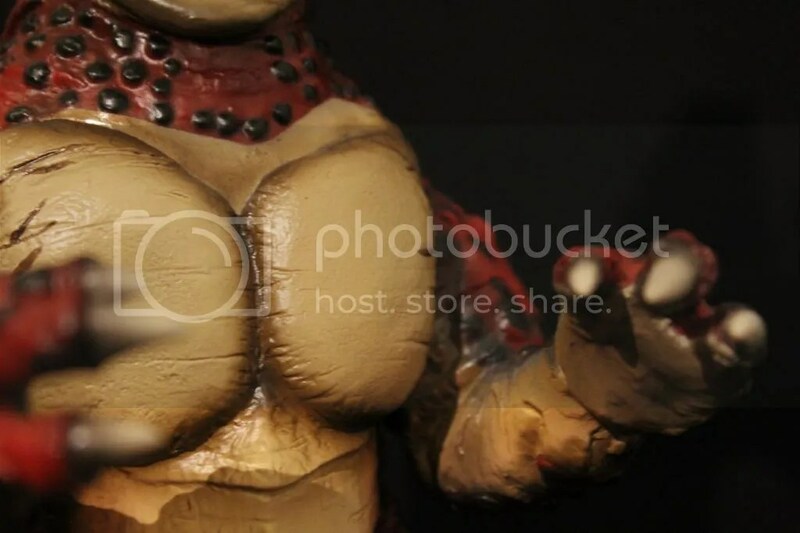 Some figures replicate the holes in the neck where the suit actor would look out of, some other figures replicate the seam for entry and exit from the suit. I just love these details. 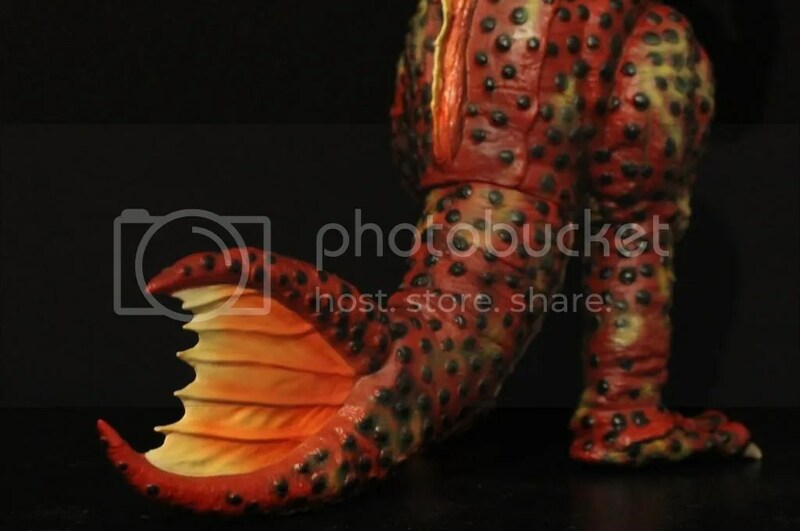 The tail is sculpted with the fan open. The paint scheme and skin is all the same from the reds and dark brown dimples. The fan itself is painted like the dorsal fins, red, orange and yellow faded out from the inside outwards. Make sure when putting the tail on to heat up the hole Squishy Soft because the tail sports thicker vinyl than most other figures. The tail is pretty thick so you will need to use the hair dryer to get the tail on. 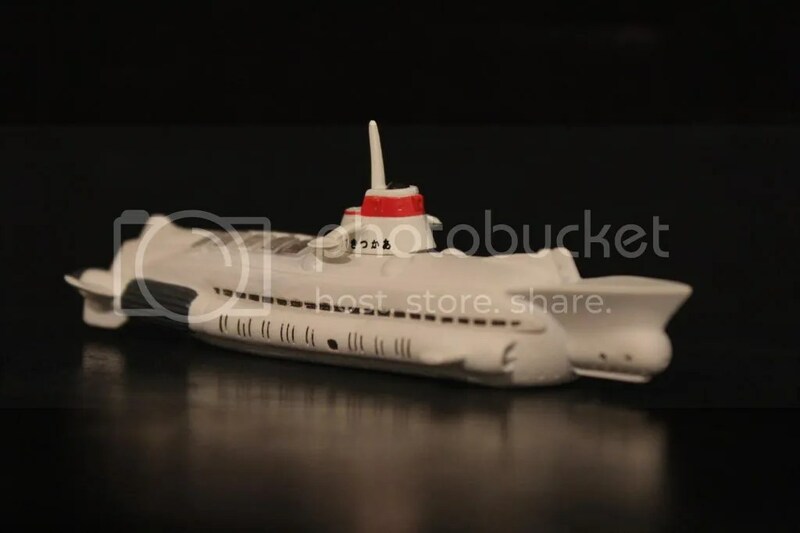 The RIC Boy exclusive is the Akatsuki submarine! The ship is small and in scale with Titanosaurus. The sub is painted a clean white with a red lining around the top of the island. The name of the ship is painted on the island as well. The windows and engines are sculpted finely and touched with black paint to define the detail. 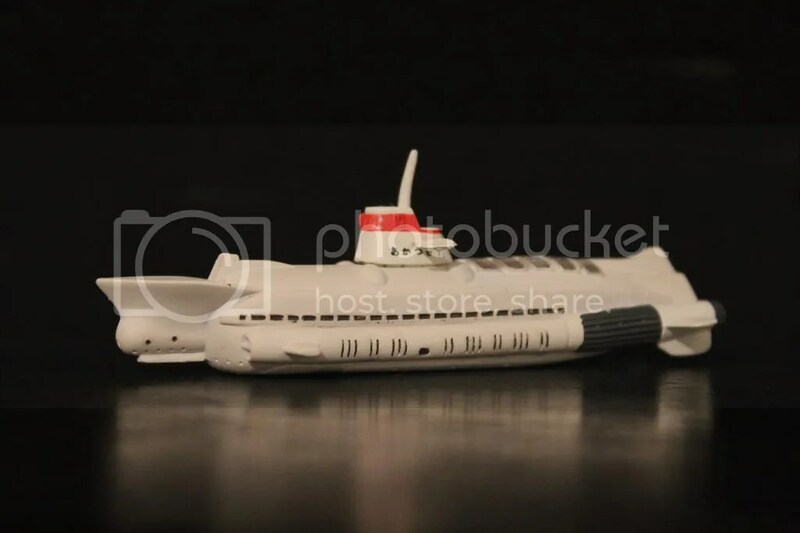 For a submarine scaled this small, you have to admit that it is beautifully sculpted, and you know what, it is. And that is it folks! I feel like I said “superb” and “beautiful” over and over again. The figure is just that, superb and beautiful. I really can’t find enough things to say about this gem. There is no reissue of this figure at the moment so this is a tough one to find. If you have one, love and cherish it, you have a rare piece. 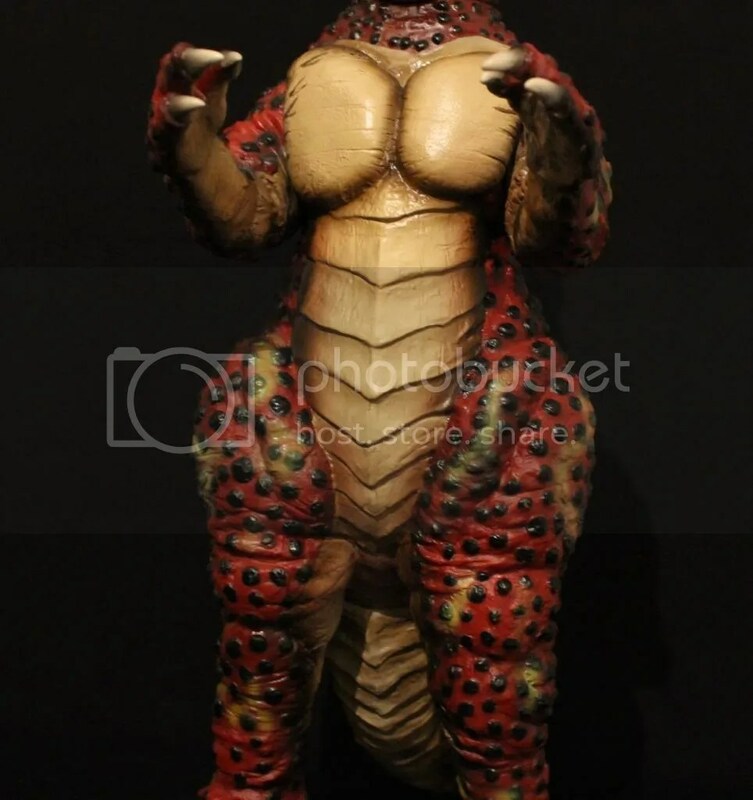 Just ask GodzillaFanFreak’s himself, Everette Grondin, he will tell you how much he loves Titanosaurus! All in all, this figure is great. I love it. I really can’t find anything wrong with this Titanosaurus. This figure is definitely certified FRESH! X-Plus literally knocked this out of the park! 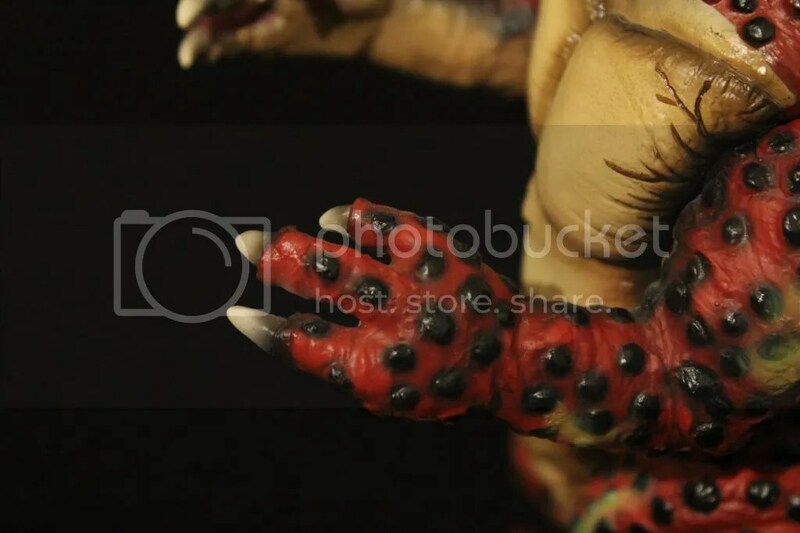 Pingback: Fresh Vinyl Review X-Plus 30cm Titanosaurus!!! | Fresh Vinyl!